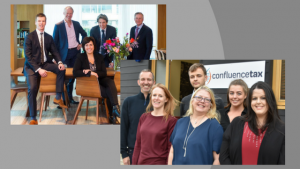 UK BASED specialist tax advisory firm Confluence Tax and Netherlands-based AsjesBisseling have formed a strategic alliance that will benefit clients across Europe. Confluence Tax is the only tax advisory firm in the UK to specialise in advising biotechnology and technology businesses and the company was born out of the need to help companies navigate the complexities of the UK tax system. AsjesBisseling has extensive experience offering tax advice and implementation for a range of clients, with a focus on innovation, especially companies and funds in the life sciences and IT. Both firms have been set up by former “Big Four” employees and are focused on providing innovative client solutions through forward-thinking agile teams. The alliance will offer clients a broader geographic spread while retaining familiar ways of working. Both Confluence Tax and AsjesBisseling are actively involved in lobbying and shaping the debate on improvements to the tax systems in their respective jurisdictions. “There is a clear strategic fit between our two companies in terms of industry expertise and handling complex tax issues and we are delighted to be working with AsjesBisseling on deals across Europe. Our clients will benefit from access to a larger tax advice network and joined up approach. “Dutch life sciences companies and funds are, by definition, internationally orientated. As a boutique tax firm, AsjesBisseling is very happy to cooperate with Confluence Tax, thus offering seamless Dutch-UK advice. Because of the combined expertise of our companies and our mutual focus, personal attention and high quality advice is guaranteed. Confluence Tax is a member of the BioIndustry Association – Colin Hailey is chair of the BIA Tax and Finance Committee – and a member of One Nucleus, an international membership organisation for companies working within the life science and healthcare industries. The tax system as applied to biotechnology and technology companies is complex and many companies require tailored advice to navigate through it – hence, Confluence Tax was born. AsjesBisseling Tax Advisors is a boutique tax firm with offices in Amsterdam, The Netherlands. AsjesBisseling offers tax services by (former “Big Four”) seasoned professionals. We build longstanding relationships with our clients, which are predominantly innovation companies/investors in life sciences, health and IT. AsjesBisseling has broad experience in setting up tax-efficient group structures, restructuring companies (in view of a future exit), and providing guidance on the introduction of tax-attractive incentive plans for key personnel. Furthermore, AsjesBisseling has expertise in the implementation and optimisation of the Dutch innovation box, a Dutch attractive tax measure for income from self-developed IP. The Asjes Bisseling team at their Amsterdam office and the Confluence Tax team in Cambridge.